Paint Night! Paint and sip! Enjoy a night out with friends while sipping on wine and cocktails. Create a 16 x 20 inch painting during our two hour laid back class. Introducing a new way to experience the New York City social scene at your fingertips. Channel your inner Monet and enjoy a picture perfect event where cocktails, crafts and canvas collide! Brushes are provided. Bubbles are encouraged. Unleash your creative spirit during these classes, where art-making and cocktails go hand-in-hand. 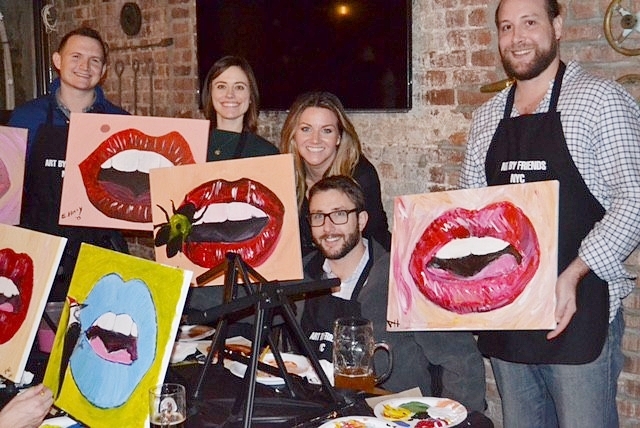 Art By Friends NYC organizes fun events with a laid back environment where you can explore your creative side while enjoying a night out. We provide all the class materials you will need. With a number of themed classes offered—including Bubbles & Brushes, Creativity Uncorked and Kiddies & Canvas—there’s something to suit every taste (or enough to try several classes). Bubbles & Brushes: Sip and paint! With the help of our friendly staff you will leave at the end of our two hour session with a 16 x 20 inch masterpiece! Creativity Uncorked: Cocktails and crafting! Unwind with friends while fashioning DIY decor! Kiddies & Canvas: Shirley temples, mocktails and more! We also specialize in art activities and painting classes geared towards children and tween parties. You’ll be impressed by the work you’ll create in just two hours. Please email us at ARTBYFRIENDSNYC@GMAIL.COM to set up corporate and private events. Our events are great for date nights, birthday parties, bachelorette parties, girls night out, showers, fundraisers, corporate team building and children's events. ART BY FRIENDS NYC EVENTS are PERFECT GIFTS! Check out our calendar for a list of UPDATED events!